1. How long have you been teaching Yoga Tune Up®? And what are your particular areas of interest/expertise? I started teaching YTU in 2011. At the time I had been teaching yoga for nine years and I was ready to differentiate my teaching. Here we are in 2018 and after all these years of teaching and non-stop continuing education, my areas of expertise are retraining back pain, improving breathing and reducing inflammation. 2. What are you most excited about learning right now? I’m all about lower back pain and rehabilitation. 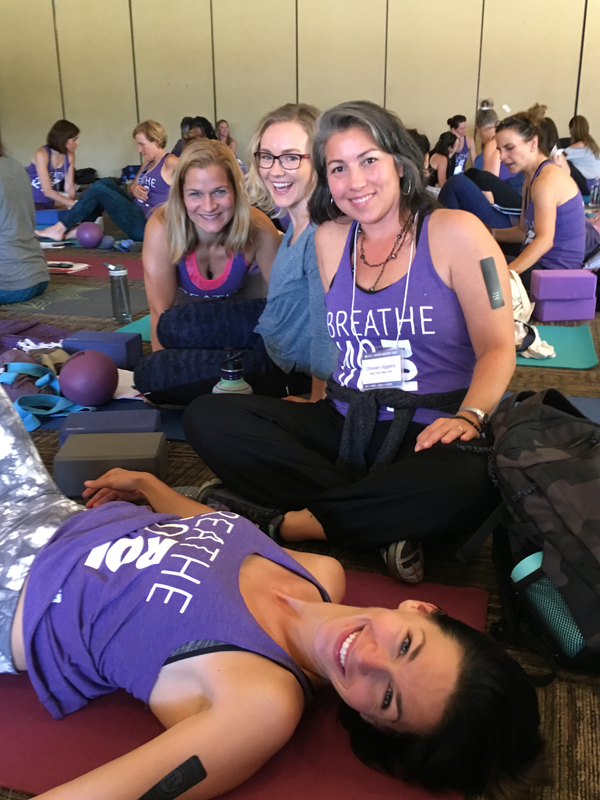 This work works and it’s exciting because it’s a beautiful integration of my past twenty years’ experience with yoga, Tune Up Fitness®, nutrition, craniosacral therapy, neurokinetic therapy, pain science, breathing and rehabilitative functional exercise. 3. Who do you hope to reach with your teaching & training? When I teach my weekly Yoga Tune Up for Self-Care classes in New York City, I am teaching to mostly women of a certain age (45-75), who are highly motivated to be pain-free and as active as they can be. The majority of my students have back pain or other injuries. They come to my class because they feel cared for, adequately challenged, empowered and more confident with me as their teacher. 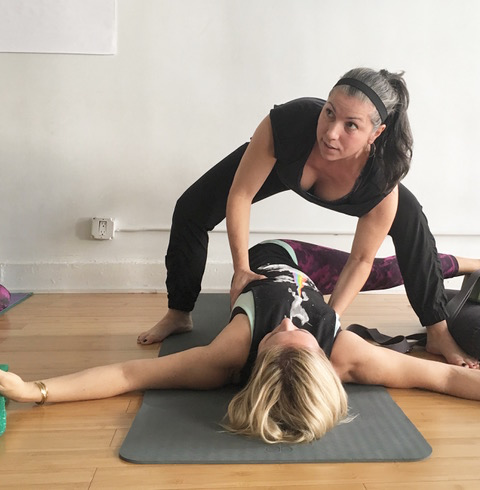 For professional trainings, Jill Miller’s work attracts really smart movement educators and I aim to continue to attract these exceptional leader-teachers. 4. What motivates you each day/week to keep pursuing excellence as a teacher? A great teacher is like a great actor; they’re so good at their craft that we don’t even know they’re plying their trade on us, until it’s over and we feel totally inspired for having had the experience. Each year at the YTU Summit, Jill and Robert purposefully create programming to develop “Presentational Excellence” in their teacher trainers. As a result, Tune Up Fitness trainers are some of the best teachers around. I am grateful to be a part of this supportive and encouraging community. More personally though, being a great teacher has a direct correlation to my aspiration to be a great coach, motivator and influencer who can effectively empower people to live more healthfully. Did you know that two-thirds of all deaths in the US are due to diet and lifestyle factors? I am driven to be the best teacher I can be so that ultimately, I can be a resource for others to avoid unnecessary pain and suffering. 5. In the upcoming month on the Tune Up blog we are going to be exploring themes around “pain”. What’s your professional experience with pain? Any thoughts or insights you want to share? I’m so glad that you’re exploring pain on the blog and I look forward to contributing. I endured a two-year period of debilitating lower back pain. I have since immersed myself in pain-related trainings and poured over hundreds of pain science studies. Pain is a perception of input. Although we often think of it as a mechanical failure, pain is signaled chemically, neurologically, mentally and emotionally. It is wrapped up in what we think we sense, what we remember, what we eat, how much we sleep, the quality of our breath and the health of our neurologic signaling system. It’s fascinating, exciting and sometimes excruciating, but pain can be retrained. 6. Do you have any trainings coming up? Where and when? Thanks for asking! 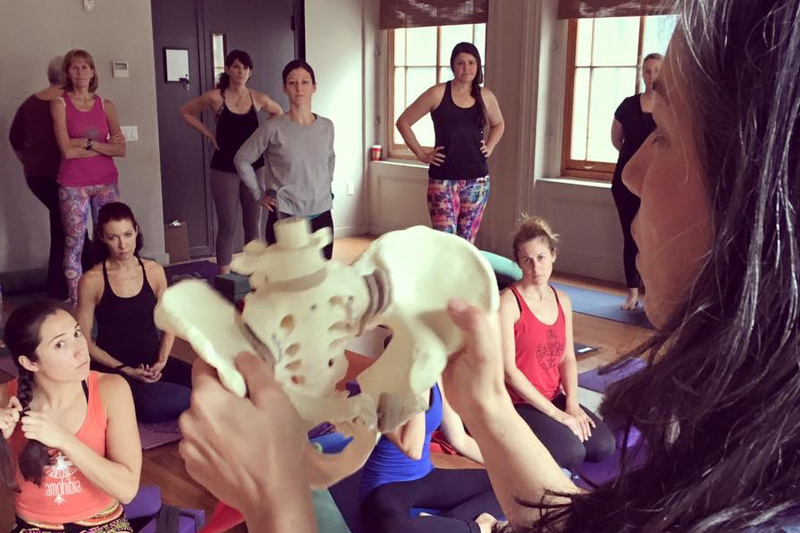 You can find me each fall in NYC teaching the Roll Model trainings in early October, followed by our annual YTU teacher training the first week of November, all at YogaWorks Soho in NYC. This year, we’re also offering a Core Immersion. Beyond that, in March 2019, I look forward to getting back to Europe again to present a Hips Immersion and Roll Model training weekend in the Netherlands. Later that same week I roll in to Philly to present our first ever Roll Model trainings in the city of brotherly love. I’ll also be back at Kripalu September next year with another Core Immersion. Dinneen is also founder of Phytolystic – “plant strong” health coaching. 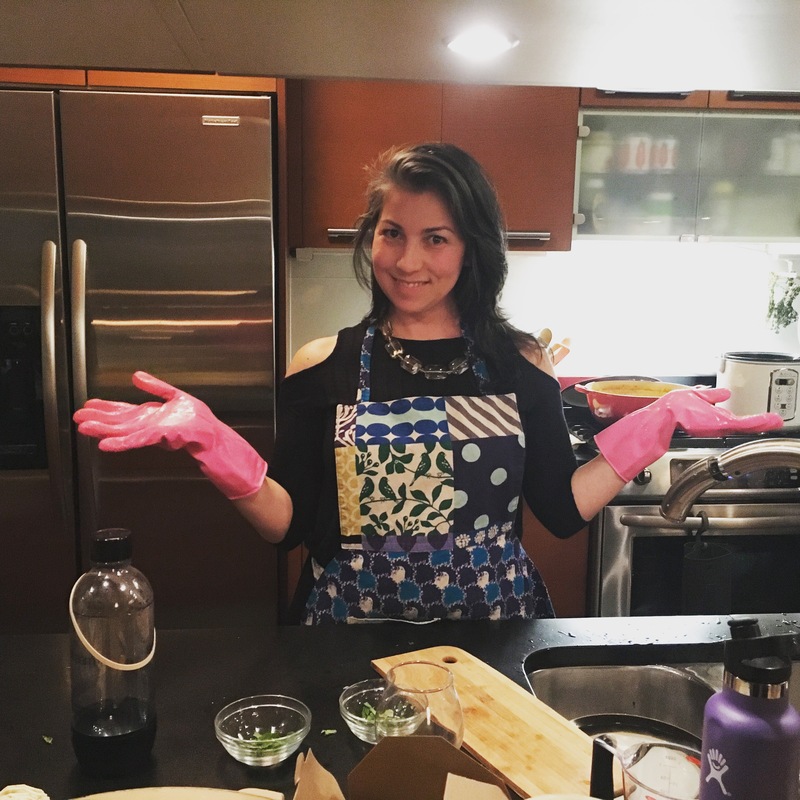 Here she is cooking in her Harlem kitchen! I couldn’t agree more on your views on pain. I strongly believe that we can retrain or rewire the way we experience and perceive pain. From personal experience, I have done a lot of work to rewire how I see and feel pain and how I address it and what kind of energy I give it. Going deeper into the emotional, mental and spiritual sources and blockages that can lead to physical manifestations has also been huge in my own healing process and in aiding others on their journey. Thank you for sharing your knowledge, experience, and views. “Pain is a perception of input. […] signaled chemically, neurologically, mentally and emotionally.” I could not agree more. I think sometimes we get so wrapped up in our pain, we forget what it truly is, as well as the many factors that play into pain. Thank you for your dedication to serving as a resource for others! Thank you for this insight. My big take away here was the statement concerning pain being viewed as a “Mechanical failure” when it is in fact experienced in so many ways, “chemically, neurologically, mentally & emotionally “. I never saw an injury in this way. I always thought “this is broken, let’s fix it Now!” This opens up a whole new avenue for me. Thank you. Dinneen has been truly inspiring with her vast knowledge of pain management, movement & biomechanics of the body. I can see this information is going to be in greater demand as folks take charge of their health and well-being and discover the benefits of her classes. Thanks for your insight on pain! I, too, live with pain and I’m inspired by your studies and knowledge. Pain is definitely not failure, but signals that me must listen to. Thanks Dinneen! I’m just completing YTU level 1 training and my head is full!! Full of ideas to integrate, full thinking of clients who’ll benefit and full of not only digestion, but what I’m inspired to study next. I feel this training is just the tip of the iceberg and I look forward to years of discovery and refinement. I feel so grateful to have joined the YTU community and I thank you for setting the bar high and laying a path. Hope to catch you in NYC some day! Very inspired by reading this blog post. I have specific areas of the body I am focused on learning more about myself. One subject I am just scratching the surface of is “pain”…learning more about what it is and isn’t. I am so happy to read, that you are coming back to Europe to do a Hips Immersion and Roll Model training weekend in the Netherlands! I did a Level 1 YTU teacher training after teaching yoga for 11 year and is has changed all my teaching. Thank you again, Dinneen! The analogy about a great teacher being like a great actor resonates with me, as I aspire to operate at that level more consistently. Sending your website link to my dad as week speak- thanks for being a great resource! Wow! This is so powerful! “But what is it called when your entire body is a blind spot“ gave me chills. Grief and depression separate or combined wreak so much havoc on our bodies and minds that we lose ourselves. I know I have been there, am there. I am fighting my way back now. Using a similar path of working out, moving on the breath, and myofascial release using YTU therapy balls. Thank you for sharing your beautiful journey.